Greetings to new and old subscribers! Faith Ed. just received two more reviews, and I’m thrilled to share excerpts from both of them. Does it give days off for Rosh Hashanah and Yom Kippur, the holiest days for Jews, and for the holiest days for Muslims and other faiths? If not, does it at least allow excused absences for religious reasons and encourage teachers not to give tests on major holy days for various religions. What type of holiday policy does the school district have in general? New York, as you may recall, made a huge change last school year when it decided to give Muslim holidays off beginning this fall. Educate, Don’t Celebrate: A theme that echoes throughout Faith Ed is the idea that teachers shouldn’t center instruction on religious holidays in December and make it more about celebrating than educating. The tradition, of course, is for our youngsters to cut out Christmas trees and menorahs each winter. Sometimes, teachers add actual instruction about the holidays, but often, they do not. 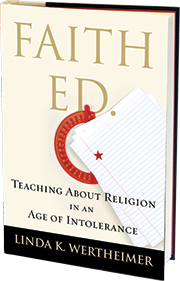 Check out the How Young Is Too Young chapter in Faith Ed. for an example of an elementary school trying to do it right. The teachers teach about three world religions in late fall and include information about each religion’s holidays. 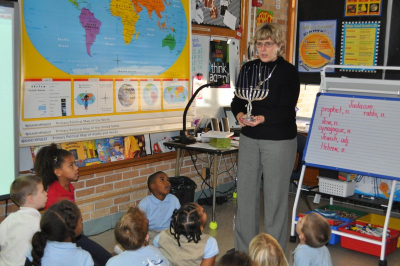 So, well before Hanukkah rolled around, I took this photo of a Wichita teacher explaining what a menorah was to her first-graders. Georgia-Bound: I’ll be giving a talk about Faith Ed. 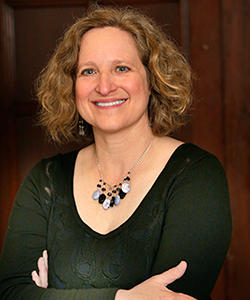 on Saturday, Sept. 5, at 12:30 p.m. in the First Baptist Church of Decatur Church as part of the Decatur Book Festival. If you live near Atlanta or know friends near there, please urge them to come! It will be done as an interview with an Atlanta Journal-Constitution reporter. Coming up: You can always see my full events list on my website. But in case you missed this previously, I’m giving a talk on Sept. 10, 7 p.m., at Newtonville Books in Newton. I’ve attended many readings there over the years, and I’m delighted to give a talk there. Tagged Beacon Press, Boston Globe, Decatur Book Festival, Faith Ed, Kate Tuttle, public schools and religion, religious holidays, Wichita Eagle. Bookmark the permalink.